Connect with what self-love truly means to you with this powerful 10 minute self-love visualisation meditation from Susanna Newsonen, life coach and creator of the ‘Self-Love Booster‘ e-course. Susanna shares this audio from the e-course which starts on Monday 18 February, find out more about it here. Self-love, by definition, is regard for one’s own wellbeing and happiness. But what does that exactly mean? What does it look like? How does it feel? How do you even get to that healthy place of self-love? Sometimes these questions can get so overwhelming you give up before you’ve even tried. The thing is, there isn’t a one-size fit all formula for self-love. What makes you feel a healthy dose of self-love might not be what makes your partner or best friend feel it too. That’s the beauty of it. Experiencing self-love, and practising it, is an experience that’s completely unique to you. But, still, it can be hard to know how to start. Which is exactly why I created this Self-Love Visualisation meditation, which also features in the 15-day ‘Self-Love Booster’ e-course, alongside two other self-love meditations. If you’re curious about self-love and intrigued about what it looks and feels like for you, take ten minutes out of your day to listen to this Self-Love Visualisation. It will help you to get one step closer to understanding what the right type of self-love looks like for you. As a result, it will be easier to start taking the steps you want to experience more self-love in your life. Set aside 10 minutes and find a quiet and calm space. Sit comfortably and take a few deep releasing breathes. Click play below when you are ready to start. Want to learn to up your self-love? 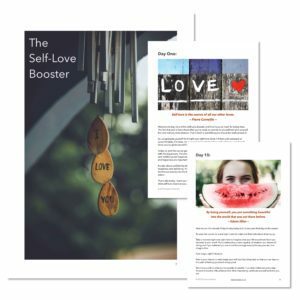 Join Susanna on her 3-week ‘Self-Love Booster’ E-course which starts on Monday 18 February 2019. Designed to help you move beyond accepting yourself and to start celebrating yourself, you’ll walk out of this brilliant course with a toolkit of tips and bite-size hacks you can embed into your day-to-day life.